When I did the grocery shopping over the weekend I bought an eggplant. One of the great thing about a plant-based diet is there are a lot of plants out there to try. I have only had eggplant one other time so when I saw it was on sale I decided to buy it. Then I had to decide what to make that would be dairy free. I thought about all kinds of Italian dishes then decided to just wing it as usual. While grocery shopping I also saw and bought some Daiya faux cheese to try, more on that later. I didn’t taste test this before dinner. I wasn’t sure how it would turn out so I didn’t take a picture. The picture below if of it re-heated this morning (for breakfast). I cooked/streamed all of the ingredients separately and put them in a casserole dish but next time I’ll make this a one pan meal. I’ll include directions for both below. Layer all ingredients in an oven safe dish. Heat for 20 minutes or until warm in an oven at 365 degrees. Add noodles and peeled, cubed eggplant to water then boil for 10 minutes. If you want tender broccoli add it now too. 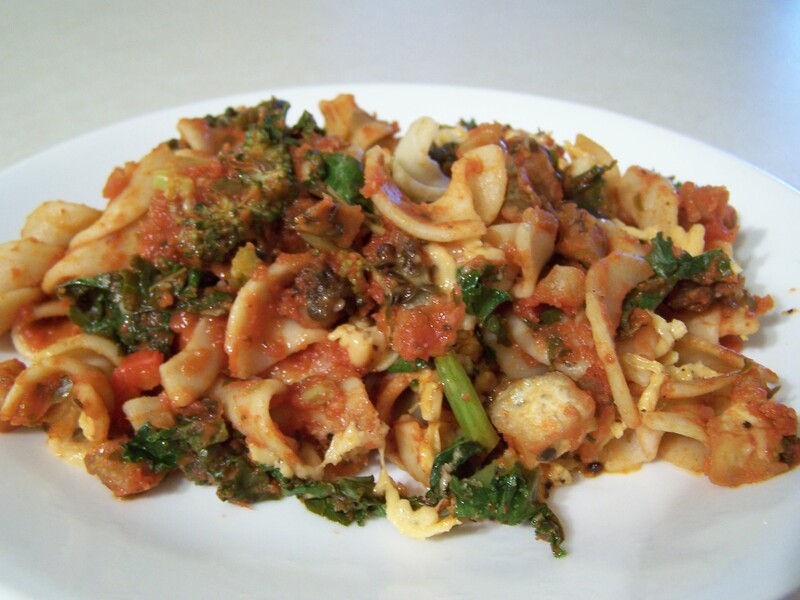 If you prefer tender-crisp broccoli add it and the red bell pepper 5 minutes into the noodles/eggplant cooking cycle. Two minutes later add the chopped Kale. Once everything is cooked well drain water. I find it easiest to dump it into a large colander. Pour back into your large pot and add pasta sauce. Once sauce is warm add faux cheese. This can be served with a side salad and french bread or on it’s own. My husband and I loved this. My 3 year old liked it too but he didn’t like the chunkiness of all the veggies. Next time it might be worth it to puree them in his. The 1 year old loved this too but started having a reaction to something in it. We are not sure what so we will not be giving this to him again soon. This was tasty this morning but not as good as it was when I first made it. I know it is not typical breakfast food but ever since I ate soup for breakfast last week I’ve been enjoying dinner for breakfast. Soon I’ll make breakfast for dinner and balance out the universe. I bought the Daiya faux cheese to see what all of the fuss is about. The 3 year old, who really misses cheese like it, or at least liked seeing it on his food. It was OK but I’d rather not have any. It would probably be a good transition food if you really thought you needed cheese but I don’t miss it. Have you tried any new foods lately? This looks and sounds really good. I think I saw that cheese at spouts on Sunday, is that where you got it from? I’m having a hard time finding fake cheese that is casein free. Weird that it is in even fake cheese, when that is usually the culprit when having a dairy issue, not lactose. Anyways, I am missing cheese and butter, but am slowly “getting over it”. Do you think that the baby is having an issue with wheat? I know you mentioned it being rice too. Sprouts had a really good qunioa pasta. Also Trader Joes also just came out with a Corn pasta. It takes like regular pasta! Aaron could not believe it was corn. Also it’s only about 1.39 a box, much cheaper that quinoa. Aletia, I did find the Daiya at Sprout’s and it is Casein free. They also have Earth Balance on sale for $2.99. I don’t think wheat is the issue because he regularly has wheat without any reactions. The corn pasta you mentioned sounds like a great deal. I’ll check it out next time I get to Trader Joe’s. My husband sent me an email today saying he loved the Italian Bake and wants to have it next week, so I guess it is a keeper.